As some of you may know, I am a big fan of Film, Concert, and Comic art. So, I decided to share some works of art for those that might be interested. Now, I don't fancy myself any kind of art critic, I am really just showcasing some pieces that I admire or have in my personal collection. 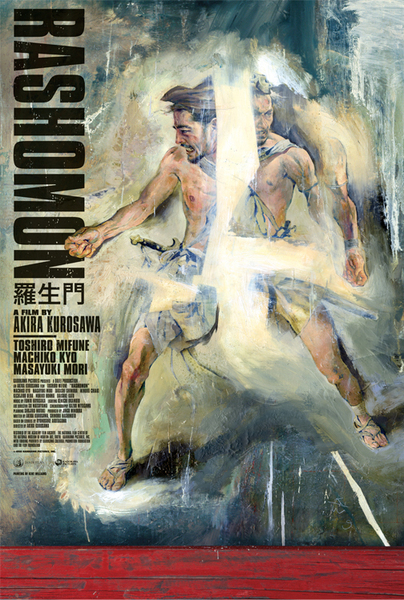 The first selection for this subject is the Rashomon painting, inspired by the Akira Kurosawa classic. The artist behind this piece is Kent Williams, a very talented artist that utilizes a great mix of realism and abstraction in his paintings. Up close, this piece is far more spectacular than what it looks like here. For those of you that have watched this film, the portrait really speaks volumes. For those artist out there, if you would like to be featured in one of the upcoming posts, please let me know. This piece, as well as others from this artist can be found at the following link. It is also available for purchase through Criterion for an amazingly low price.